Yesterday was a beautiful day in Venice, and a special one too. A rally was held at the First Baptist Church of Venice at E.L. Holmes Square (7th and Westminster) to celebrate both our town's diversity, and a year and a half of resistance against the sale of the historic church. There are rallies on the steps of the church every Sunday, and this one was extra great. We were going to film it for our Venice documentary, 90291: VENICE UNZIPPED as part of the history of this beloved place we call home, so organizer Mike Bravo helped us gather the troops to make it a great one. Venetians of all races, religions, ages, and genders came together to offer our respect, and our solidarity. We stood together all afternoon to show everyone that Venice remains strong and together, not divided like VNC meetings would have you believe. The Sunday rallies are in opposition of the sale of First Baptist Church to a single family (the Penskes, and seriously, what is wrong with them?! Why would you want to live there after all of this resistance?! Go away. ), but it's really about much more than that. 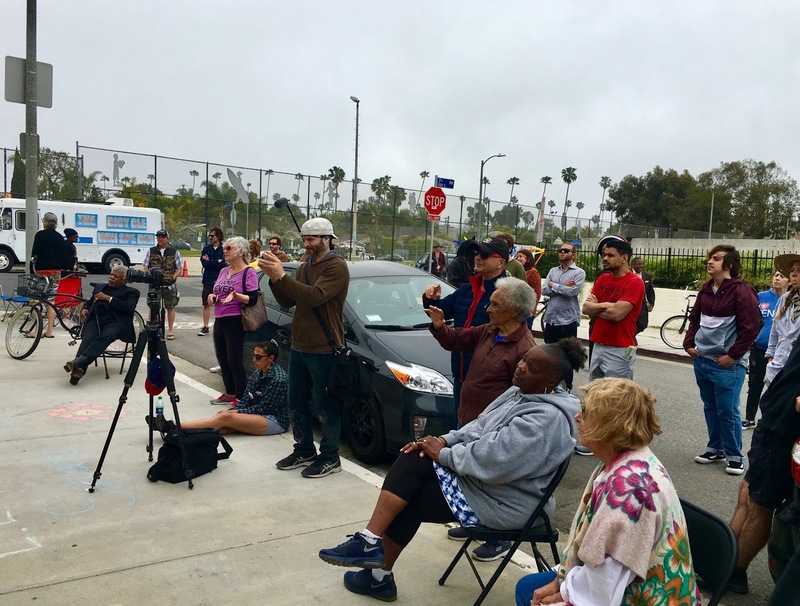 It's about the history, the diversity, and the community - and everyone gathered around on this Sunday was determined that those things that make Venice great aren't going anywhere. 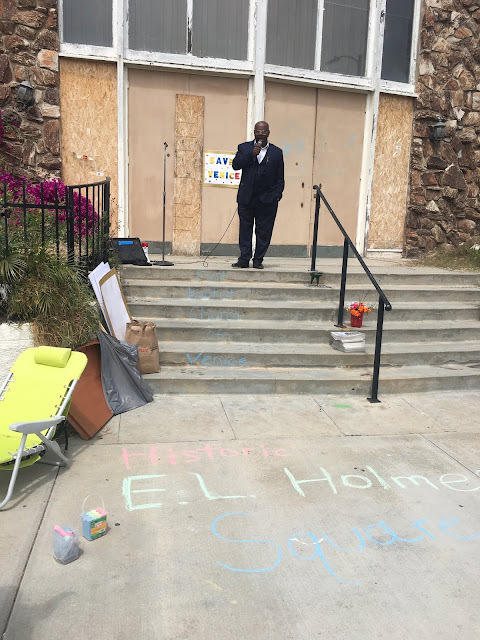 Friends, neighbors, and supporters showed up with refreshments to share, chalk, sign making materials to share ... everything, including wisdom and solidarity, was to share. Several Reverends spoke with passion and enthusiasm, getting everyone to shout "Amen!" along with them as they told of the history of the Church. 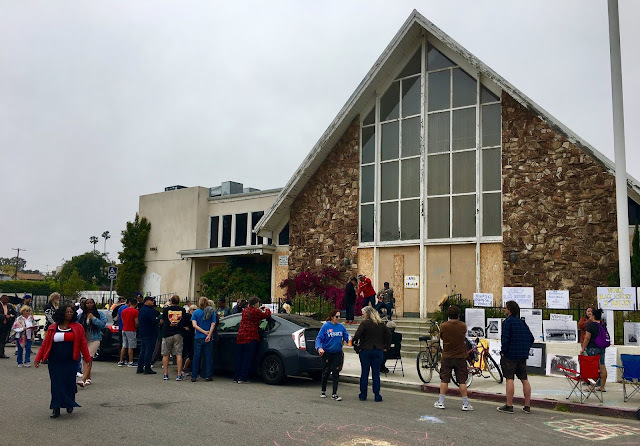 It was about more than religion, as all were welcome as a community center, every day of the week. 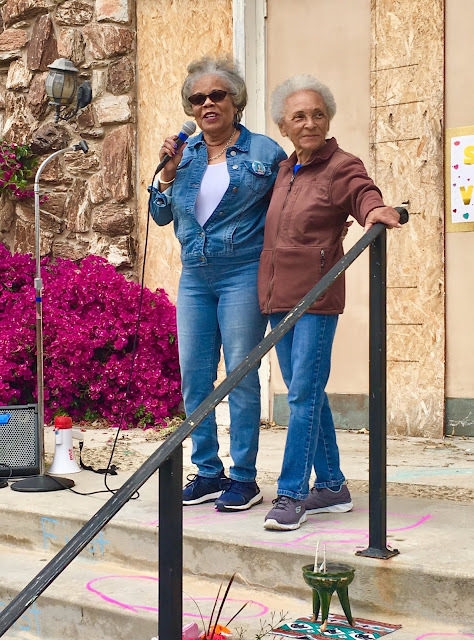 Elders like the wonderful Jataun Valentine, Laddie Williams, and Naomi Nightingale spoke to the history and to the struggle of both the Church, and the Oakwood community. Anyone that doesn't know the history of Venice would do well to sit at these ladies' feet and learn something. They spoke about how Venice never used to have tall fences that kept people out ... it was more about longer tables than bigger walls. People knew their neighbors. People stuck up for their neighbors. And that's what we were all doing yesterday. 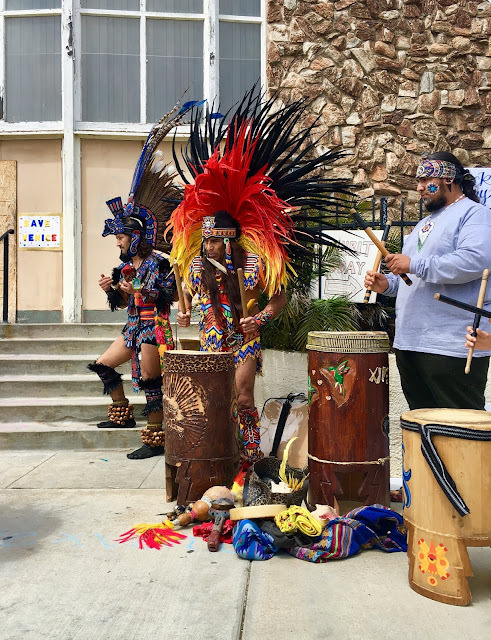 Mike Bravo sang a song and banged his drum, and told about the Mexican and Indigenous people that have also been here for generations ... always. Sage was burning and you could actually feel the presence of ancestors on this sacred space - you really could. Children made signs next to adults, passing the respect down to the next generations. People drew with chalk in the streets to let everyone know what was going on, and urged those biking or walking by to stop and join in the fun, and in the history. 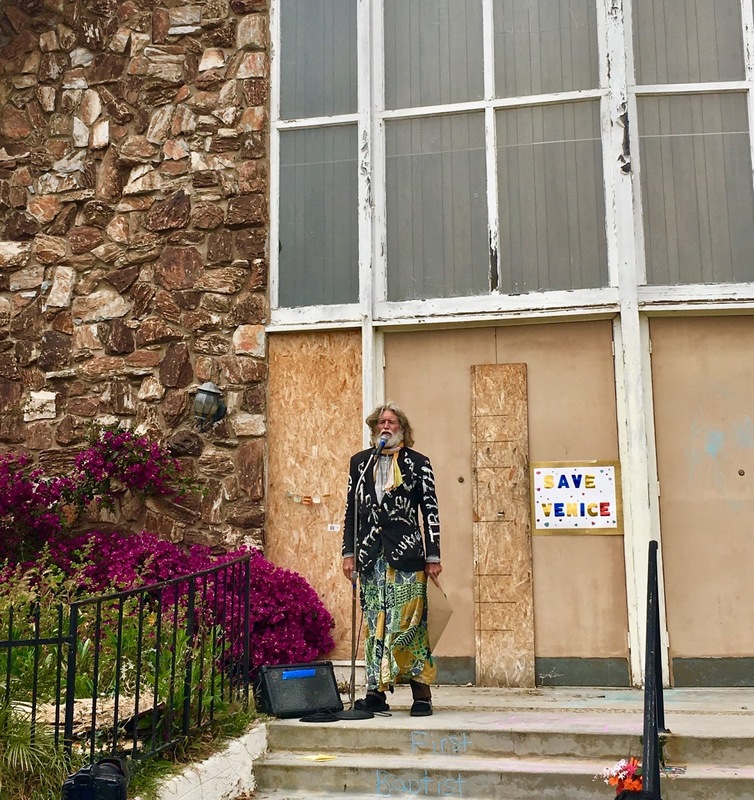 Caviar from Horny Toad played songs on the steps, as did Peter Demian, playing "Amazing Grace" and "Hallelujah" in his gravelly Tom Waits-y style (mentioning that he may have dropped a little acid prior. Classic.). 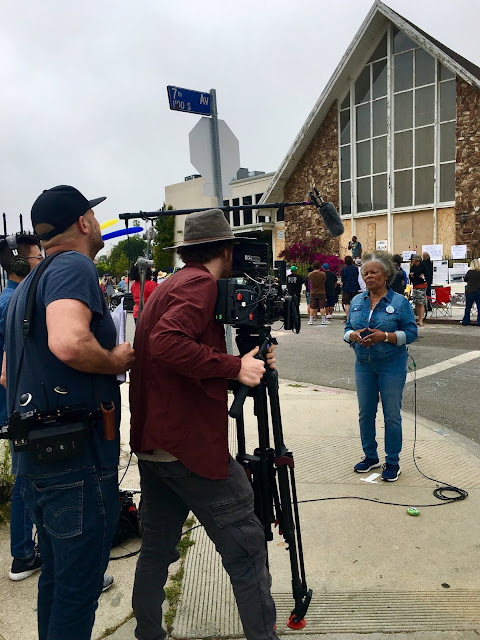 While we were interviewing Ms. Valentine for the doc, we had to contend with a zillion small airplanes flying over, and then another noise got our sound man's attention. 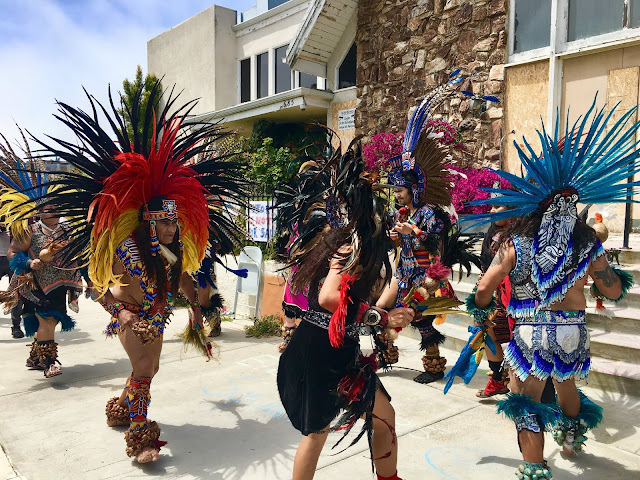 It sounded like maracas shaking, and when we looked down the street, here came a man in full Aztec regalia, ankles and wrists covered in shells that were making the rattling sounds. 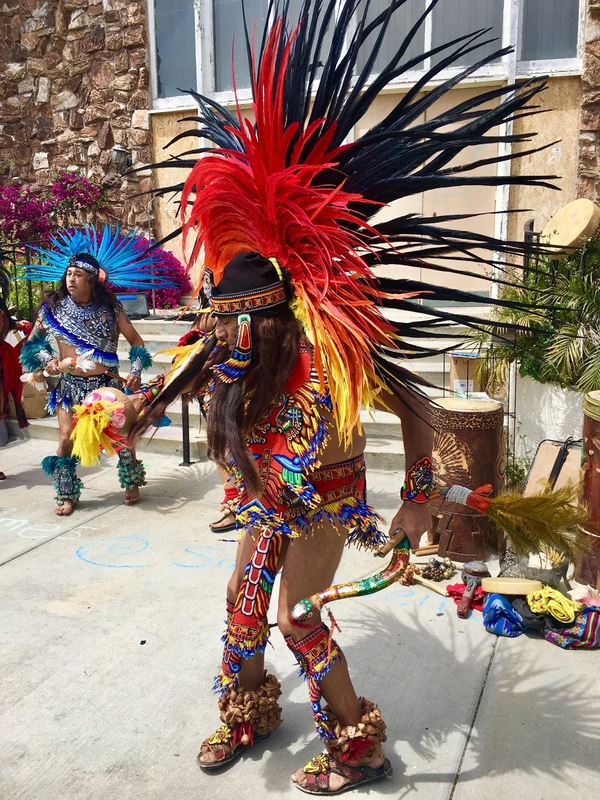 The Aztec dancers had come to show their solidarity, and their respect for the spiritual center we all stood on. It was so cool. 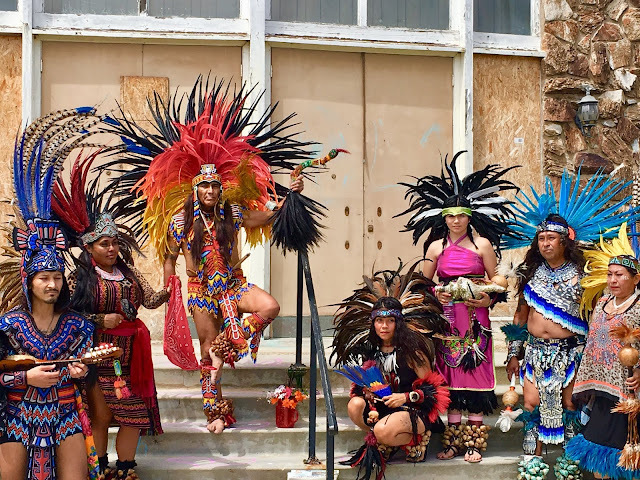 The dancers blew shell horns and placed offerings on the steps of the church, and then treated us all to their native dances. The drumbeats kept time, and the shells rattled along, as passersby in cars slowed and people came out of their houses to see what was going on. It felt emotional to me all day, but this was chill inducing, as the area's history became tangible in our faces. It was something else. 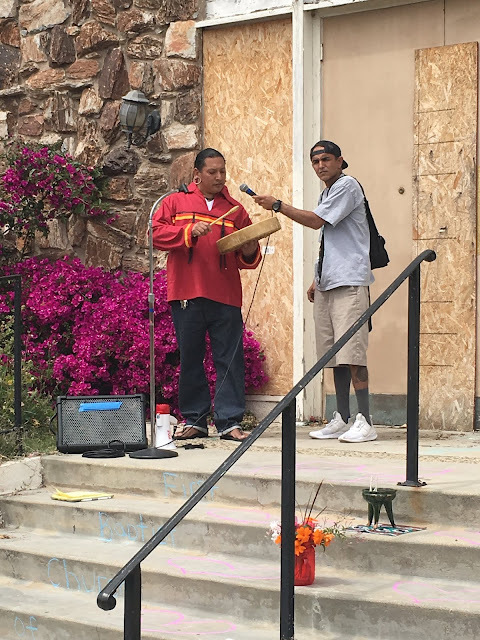 There were a lot of people getting up to speak for the open mic part of the afternoon, and David Busch had "More Love" to give. That was a powerful aspect to the day, that you could look around and see people that have their own causes, and the people present on this day were the ones that participate in each others' issues - because that's how you create a strong community. The ones that stand up against chains. Against Snapchat. Against illegal sales of churches. 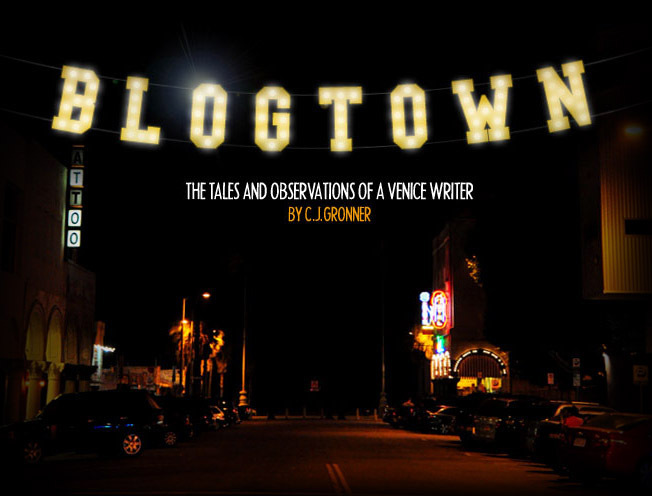 That show up for the fun stuff too, but most importantly, the ones that show up for one another, and for VENICE. The ones that know that the People still have the Power. The afternoon grew chilly, and Bravo had everyone join hands in a circle for the closing ceremony of the day. I got choked up looking around the circle, with all colors, ages, religions (or no religion), income levels ... all holding hands and there for the same thing - to stand up for our Venice. Each person said a little something, and all included thanks and love for everyone there in their message. It was a powerful day, and a powerful group. That isn't going anywhere. I again offer my thanks and love, to everyone there and to everyone who cares ... because that's where it all starts. With loving and empathetic hearts that care about everyone who shares our community, not just themselves and their ever-higher walls. It was an honor and a relief to be surrounded by love-minded people that continue to make Venice a magical place of inclusion, diversity, color, and spirit. Thank you all, and see you again soon! Take care! Exactly where are your contact details though? The Win-Dow - Excellent Cheap Eats In Venice!